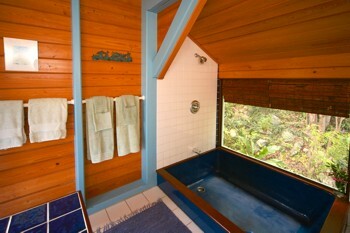 Surrounded by trees, New Moon provides a secluded setting for your vacation getaway. 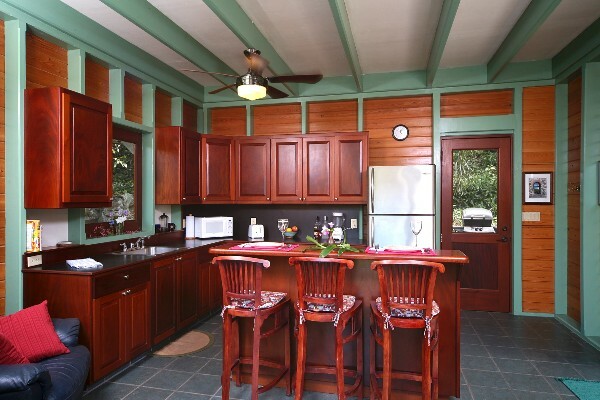 New Moon offers a spacious kitchen, beautifully appointed with hardwood mahogany cabinets and bar. 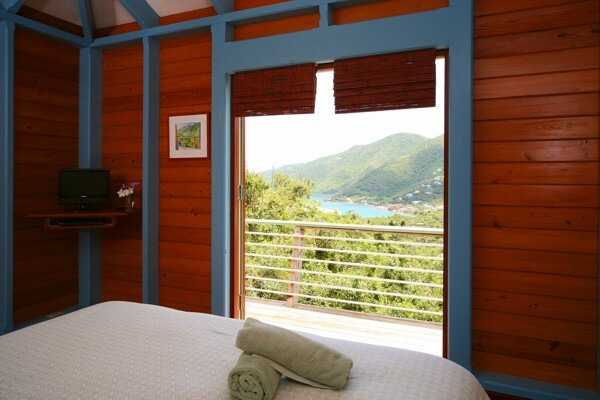 This intimate residence will make you feel right at home as you enjoy all St. John has to offer. 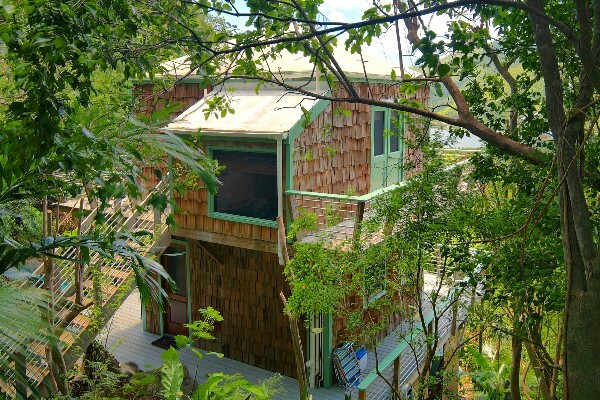 New Moon sleeps just two people, but can be rented in conjunction with Just Enough for larger parties (up to four people). 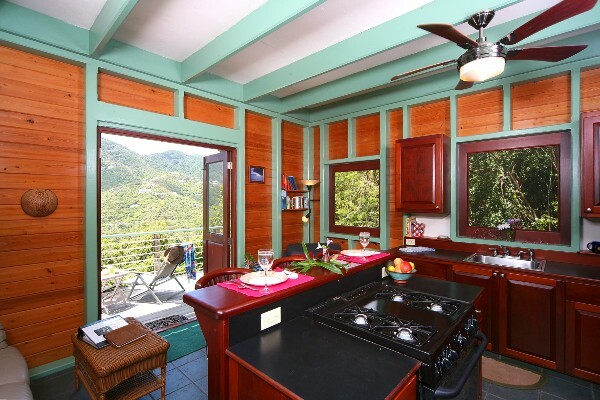 Enjoy cooking in the full size kitchen furnished with beautiful mahogany cabinets or keeping the cook company while seated at the mahogany bar. 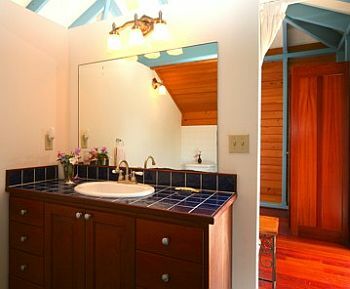 Cabinets and bar both designed and built by the owner, a St. John cabinetmaker. 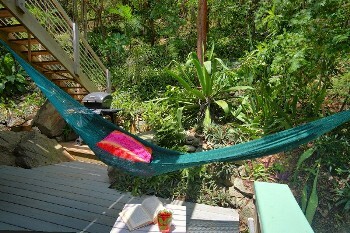 Relax in the hammock in the shade. 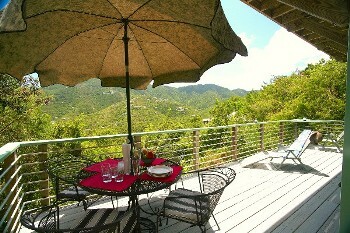 Enjoy grilling out and dining al fresco on the deck. 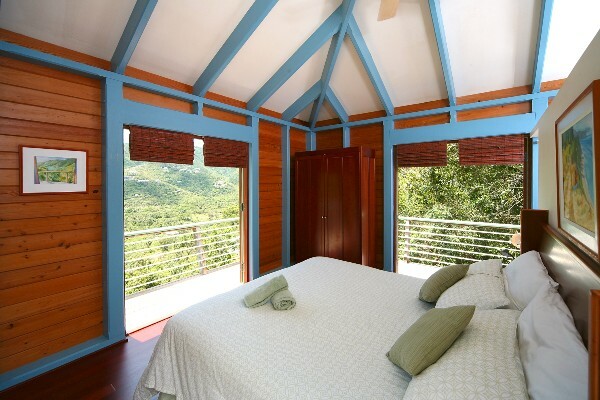 Sleep soundly amidst the sounds of the tree frogs and gentle tradewinds. Stargaze for shooting stars from the balcony. 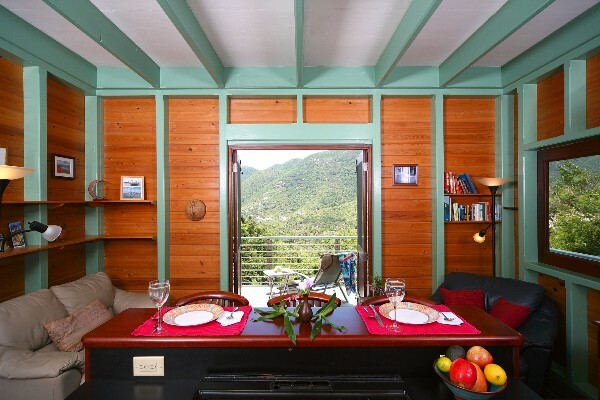 New Moon sleeps just two people, but can be rented in conjunction with Just Enough for larger parties (up to six people). 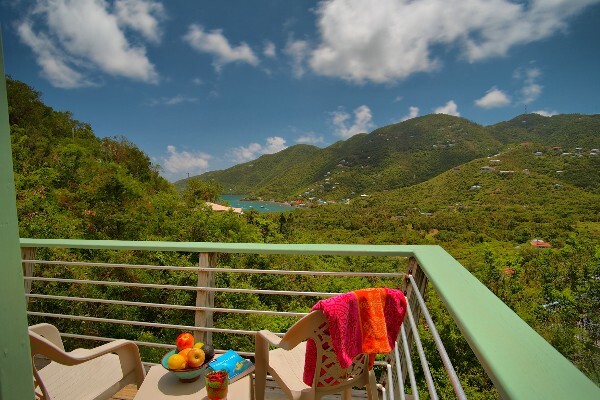 Plus 12.5% USVI Government Hotel Tax. 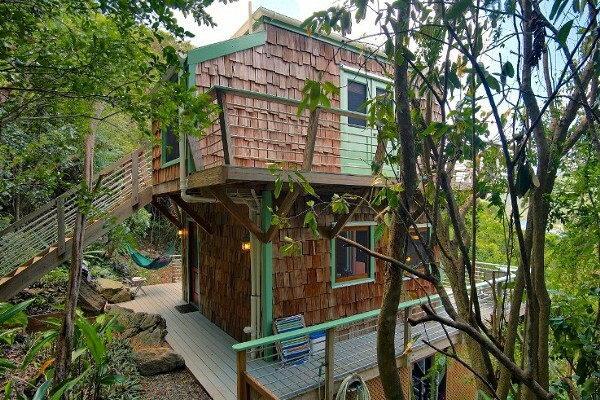 Interested in renting Just Enough and New Moon together? Inquire for special pricing. For Availability and number in your party. 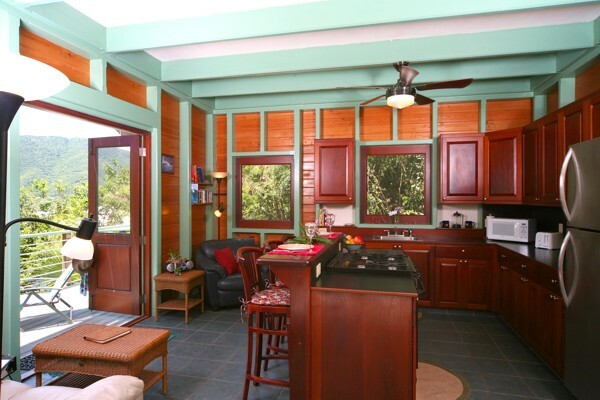 * 1st Floor: Fully equipped kitchen with island/bar, living room, indoor and outdoor dining areas. * 2nd Floor: Master bedroom with king size bed, walk-in closet, bathroom with sunken tub. The house is accessed via a well-lit stairway leading down from the driveway. 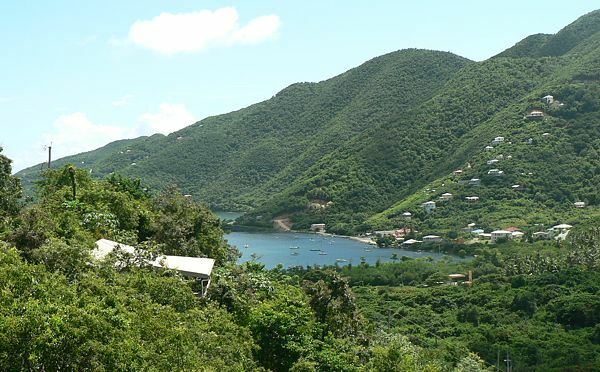 We will arrange to meet you in Coral Bay when you arrive and can assist with car rentals (we recommend a 4-wheel drive vehicle for St John). If you prefer to be met at the ferry dock, there is a fee of $75. 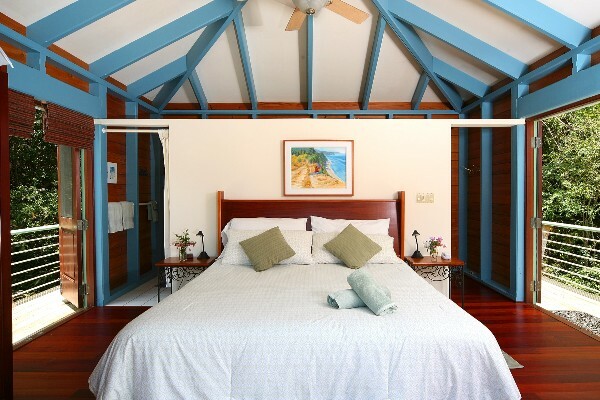 Our on-island manager will be available to orient you with the property and to ensure that your stay goes smoothly. Because we are a small business and there is a high demand for our accommodations, we must enforce a strict cancellation policy. For cancellations occurring 60 or more days prior to your scheduled arrival date, a full refund, less a cancellation fee of 20% of the cost of your entire reserved stay, will be returned to you. No refunds are offered for cancellations within 60 days prior to your scheduled arrival date. However, in the event that we are able to re-rent the property for all of your reserved dates, a full refund, less a cancellation fee of 20% of the cost of your entire reserved stay, will be offered. WE RECOMMEND THAT YOU PURCHASE TRAVEL INSURANCE.